WATERLOO, ONTARIO, CANADA -- March 1, 2010 -- Laurel Creek Software has released Precision Tile Pro 2.0, a tile layout and design program. Two years in the making, the software allows tile retailers to plan and quote tile layouts as they generate drawings for customers, the company said. According to Phil Rittenhouse, president of Laurel Creek Software, the software helps tile retailers close more sales while reducing costs. "Visualization software like Precision Tile Pro allows tile retailers to show a customer how a tile layout will look in the customer's space and explore their options with just a few clicks of the mouse." he said. "The software's high-quality full-color tile layouts are much easier for the customer to visualize than the traditional sample board and hand drawn sketches. This greatly simplifies the buying decision for customers and helps close sales more quickly." Precision Tile Pro users agreed: "We made sketches on small pieces of scratch paper, and if a customer did not have the ability to visualize their tile design from that scratch paper and a loose tile sample or concept board, they would leave to 'think about it' and often did not return." said Stuart Nelson, VP Sales and Marketing of Doma Kitchen & Bath Showroom in Bridgeport, PA. "Now, we are able to secure sales more quickly, especially for those customers who are not able to visualize from sketches and samples. We can work with the customer to build a tile design right in front of their eyes." The company announced that this release of Precision Tile Pro adds new drawing tools to improve user productivity while maintaining exceptional ease-of-use. "A great deal of thought went into the design of the user interface to make it as simple as possible while still offering virtually unlimited design possibilities. 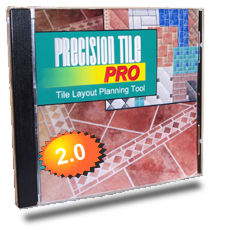 In fact Precision Tile Pro is so easy to use no special training or computer skills are required." said Rittenhouse. Stuart Nelson added "In one morning, I was able to learn enough about (Precision Tile Pro) to train my salespeople to use it the following afternoon." Savvy retailers using Precision Tile Pro have found that they can now charge for their design services, which adds directly to their bottom line. "(Precision Tile Pro) allows us to charge a fee for measurement and design services, because we can use the software to create a tangible product for the customer in the form of a professional, full color, rendered tile design." said Nelson. According to the company Precision Tile Pro also generates a detailed material list and quote that eliminates the problems of over or under estimating. Rittenhouse added "Having an exact tile count and square footage allows the tile retailer's customer to feel more comfortable with their quote and eliminates the retailer's risk of losing money due to under-bidding a job." In a slow economy tile installers and retailers have found high-tech tools like Precision Tile Pro to help them differentiate themselves in a competitive market. "I feel like I have a higher level of service with my customers that sets me apart from my competition." said Scott Callaway of Montrose PA.